Search for Google Ireland in Google and you will notice that Google does not return Google.ie but rather returns Google.co.nz. 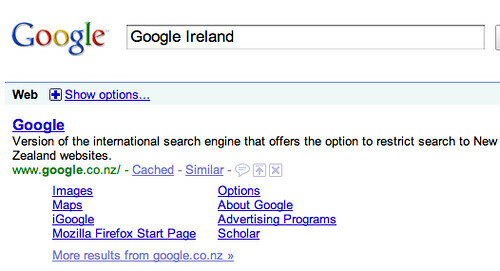 Someone should send Google a memo that Ireland is not the same place as New Zealand. Ireland is only about 12,000 miles away from New Zealand. Forum discussion at Google Web Search Help & Google Webmaster Help. Update: This is not just Google Ireland, but also Google Egypt and other properties where Google thinks they are all New Zealand.